Another artist discovered through twitter, why I didn’t join this earlier I will never know because I’ve listened to so much good music which I can’t wait to share with the world (or just my followers). Now this guy is an acoustic act reigning from Essex, but was born Derby but he’s in Essex to try and get music heard and attempt to break into the music business. He has quite a few demos on his facebook page and he’s got this one song which is fully produced which I’m reviewing called ‘Alpha Resistance’ (love the name) and it’s a big song. 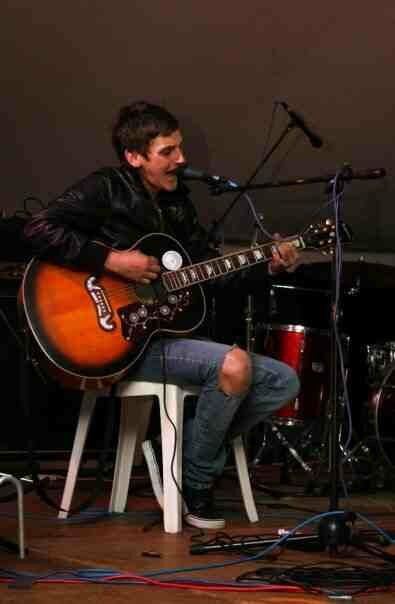 When I first looked at the picture I thought Noel Gallagher, leather jacket and Epiphone EJ-200 (I believe). I listened to all his demo ideas, and he has some very good ideas, but it was this song that really stood out (obviously because it was fully produced). When you first start to listen to it you think it’s just him and the acoustic guitar, but then all these other elements come into it and really bring the song together. It’s a really beautiful song, with some very beautiful lyrics. To be honest I was listening to it and I thought ‘good voice’ then 3:58 hits in the song, and this voice just bursts out, and sorry for the cliche but it did blow me away. The song has this amazing guitar solo in it with this sound which can only be explained incredible, it doesn’t sound too complex, but it fits with the song perfectly and really compliments it. And if you don’t believe me about his other good demos here’s his sound cloud. Cheers for reading, comment like if you wish. What has ripped jeans got to do with music?!?! I had an idea to write something there so I left that there, totally forgot about it. Thanks for pointing it out. you got a wordpress?